Garry Robinson DSM is unconquered! The Invictus Games are coming down under from 20-27 October 2018 – and we’re excited! The Australian team was announced in Sydney in June. For the fourth Invictus Games, our home-town team will be bigger than ever, with 72 current and ex-serving Australian Defence Force members selected. Because he’s a member of the Defence Health family, we’re especially delighted that former soldier, Garry Robinson, will be competing in his fourth Invictus Games. Now retired, Sergeant Garry Robinson was not expected to survive the serious injuries he received in a helicopter crash in Afghanistan in 2010. Garry spent months in a coma; two years in hospital; and eventually had his left leg amputated. He also acquired a traumatic brain injury in the accident; fractured his shoulder blades, hip, eight ribs and lower spine; punctured his lung and ruptured his spleen which was removed. He had deep wounds to his buttocks and leg, and not surprisingly, has suffered from post-traumatic stress in the eight years since the crash. Garry had always been a sporty young man, having competed in triathlons and Ironman events – he even made the Australian team for the 2009 Age Group Long Course Triathlon World Championship. Garry was still in rehabilitation when the opportunity to compete in the first Invictus Games in London came up in 2014. Garry says his sporting resolve has never left him, but the Invictus Games deliver a drive and focus to his training. “My life revolves around sport and training,” he says. “Especially now the Games are getting closer. “I’m training every day or second day, and we have to juggle to fit in medical appointments. 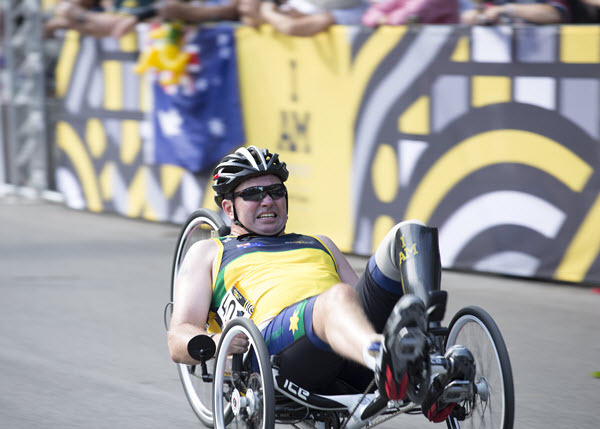 I’ve been concentrating on cycling and archery recently, and attended Invictus training camps in Adelaide and Canberra. I missed the swim camp in Melbourne in March, but definitely want to get to the next one,” he says. Garry admits his competition schedule at the Games “will be crazy”. Thankfully the road cycling time trials and criterium will both be held on 21 October. Swimming heats are 23 October with finals the next day – watch out for Garry in the 50m freestyle. And the archery is held over 25-26 October, with the closing ceremony 27 October. “The criterium is my favourite cycling event because you’re racing against other people and it’s the first over the line. My mate (Peter Rudland, who was also in the 2010 helicopter crash) won the gold medal in both events last year. That inspires me to train even harder…I’m definitely quicker and stronger than last time. It will be a test,” says Garry. But win or lose, it’s “the spirit between the competitors that makes the whole soul of the Invictus Games. “Camaraderie is ingrained in us from the first day you join (the Army). It gets stronger as time goes on. Sure, the rivalry on the start line is always high. But once it’s over, you just want to congratulate and support each other,” he says. Garry is especially looking forward to the added benefits of competing on home soil. It’s fair to say that sport, as well as the love and support of family, have been the foundation of Garry Robinson’s long and challenging recovery. Everyone at Defence Health is grateful for Garry’s past service and wish him – and his mates – the very best in competition at Invictus Games Sydney 2018.